This 2-week family adventure in Sri Lanka has chattering monkeys, historic forts, wildlife and nature, the misty mountains of the hill country, and sun and sea too! Explore Galle, Yala National Park, Bandarawela and nearby Ella, and one of the island's best beaches on this fantastic family adventure. As the name suggests, there will be forts and monkeys aplenty (not to mention the chance to see elephants and leopards!). Like all our family trips, this is a private tour (not group) with a carefully-designed itinerary to suit different ages. It can also be taken as private tour for two. Day 1 (typically Saturday): Fly from the UK to Colombo with a choice of airports including London, Birmingham, Manchester, Newcastle, Edinburgh and Glasgow. If you don't live in the UK, we may be able to arrange flights for you, or you can book this family adventure holiday excluding flights. You'll be picked up at the airport by one of our drivers (holding a Tell Tale 'pink peacock' sign) and driven south on the new expressway. The road goes through the country's lush green interior – keep an eye out for wildlife and real peacocks – to historic Galle and into the hills nearby. Arrival at an intimate boutique inn and settle into your room/s (if you are a family of 4, you will have 2 rooms throughout the tour, except at the beach hotel where you will be in a family suite). Enjoy the pool but watch out for the cheeky monkeys, which are usually langurs in these parts. On 'Forts and Monkeys', you'll have the services of a driver and comfortable air-conditioned vehicle throughout the tour. It would usually be the same person, but due to schedules/our hand selected small team of drivers, we may occasionally need to use another of the team on airport transfers. Explore Galle. One of our local guides will take you around the old British fruit and vegetable market and then into one of the best-preserved forts in the world, with beautiful historic Dutch and British buildings. Walking around the ramparts affords the best views – if you're lucky you might catch a cricket match over at Galle's famous stadium. Later on today, you'll head to a peaceful lake for a boat trip around little islands (great for bird spotting as the day cools down). You can also visit a local temple and follow your nose to an organic cinnamon smallholding. Time to pack up and head off. Next stop, a rustic resort in a lovely spot near Yala National Park, famous for having the highest density of leopards in the world. You'll have the option of driving via the Elephant Transit Home at Udawalawe National Park, an initiative to introduce orphaned or abandoned baby elephants back 'into the wild' (national parks). Time to settle in and have a dip in the pool. This evening you can have dinner at the hotel, or at a little local restaurant we like to support (our driver will take you there). Up early to explore Yala National Park with a wildlife guide, local to this area. In the morning you should see spotted deer, crocodiles, and elephants from the safety of your jeep. 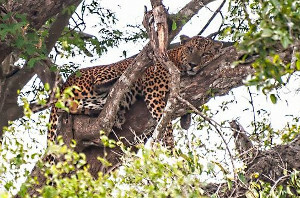 After a delicious local picnic lunch, look out for lazy leopards – exploring the park as often as we do with our small team in the area, we know the best spots. The day will be paced to your family so if you've seen a lot of animals earlier in the day and it is hot, you can choose to cool off by the pool. Or you can stay in the park till it gets dark. It's up to you! "Amazing holiday for all of us (middle-aged adults with 11, 5-6 and 3 yrs olds) - perfect for our interests which are: walking, sightseeing, photography, trains, cycling, travel and adventure, cultural experience, swimming/snorkelling, history, seeing how other people live, trying different food and learning how to cook it. Perfect relaxing but adventurous and very varied holiday, excellent experience"
Time to pack up before heading to Bandarawela. This charming market town is at the lower end of the hill country (so not quite as chilly as the rest of it!). You'll drive through some spectacular scenery, stopping at the legendary Rawana waterfalls on the way. Arriving in time for a welcome lunch, you'll then settle into your ensuite room(s) in this spacious private heritage home. Relax in the beautiful gardens, replete with roses and cheeky monkeys. Watch out for the latter though – they like to sit in the avocado trees and throw fruit at the guests! Then you'll have an informal cooking lesson to learn how to cook authentic Sri Lankan food, hopefully your delicious dinner! One of our expert local guides will take you around the hidden part of Bandarawela. You'll walk around smallholdings – the vegetables and fruit grown in this area are exotic for Sri Lanka (carrots and cauliflowers, not pineapples). You'll also get a different view of a tea estate, from leaf to pot, and you'll see how the workers live and meet their children in the nursery. In the afternoon, you'll take the train on the famous hill country line. This is a historic journey in more than one sense of the word – not only does this train line wind through the hilliest terrain, but it is also one of the few that runs the British Tyer's Tablet system, dating back to the late 1800s. The Demodara Loop (the spiralling track) is quite rightly considered a feat of British civil engineering. "Full of variety...we had great opportunities to see and experience the real Sri Lanka"
This morning, you'll be taken to nearby Ella this morning where you'll climb Little Adam's Peak (this is a relatively easy walk, rather than a strenuous climb) for some truly spectacular views. After time for lunch, it's time to take a drive for some photo opportunities – there are plenty to choose from, including Bogoda Bridge (the oldest surviving wooden bridge in Sri Lanka), or if you're feeling active, trek up to Dunhinda Waterfalls. Time for some sun and sea. You're off to the east coast, where you will arrive at Passikudah Bay. Arguably one of the most beautiful beach areas in Sri Lanka (certainly one with calmer waters), it is home to the very welcoming Anilana resort, which is located at the quieter end of the horseshow-shaped bay. Time to settle into your family suite, before an afternoon at leisure to relax by the beautiful pool with spectacular views. Passikudah is the best part of Sri Lanka for a beach stay from March to October (if travelling at other times of the year, we can customise the itinerary so you can enjoy a west-coast beach). At leisure to enjoy the pool or hit the beach. If you'd like to go snorkelling, it's easy to arrange at the hotel, you have a choice to go out on a local boat (private experience for up to 6 people), or on a beautiful sailing catamaran if it's in the area (join-in experience). At Anilana, unusually for Sri Lanka, you can even try your hand at snorkelling from land, it's protected by a reef and it's possible to see colourful fishies. This is ideal if your kids aren't so confident at snorkelling in open/deep water, but we recommend taking 'jellies' or similar footwear. You may also wish to look at buying/taking fullface snorkelling masks. If playing on a vast expanse of sandy gold beach is more your family's cup of tea, it's just a short walk to Passikudah's main beach. Or take a longer walk the other way to the quieter Kalkudah beach. At leisure or drive to the nearby town of Batticaloa. The name is derived from the Portuguese and the town's fort was an important bastion on the eastern coast during the time of their rule. However, it wasn't strong enough: it was the first fort to be captured by the Dutch and was also used by the British. The fort is tiny, it's a short walk around the well-preserved ramparts. The town is a good place for a local lunch, where the food will be different to the parts of Sri Lanka you've visited so far (much spicier!). Pack up. Time to head off to Sigiriya rock in the centre of the country. The 'Lion Rock' is thought to have been a much older (5th century AD) type of fort and you can see the rock from miles around. You'll be staying at a comfortable small hotel with lovely tropical gardens and a pool. On your way you have the option of stopping at the Ancient City of Polonnaruwa, a UNESCO heritage site which includes a famous rock temple, with four statues of the Buddha carved in the granite. There is an opportunity to cycle around the ruins on the day (note, these are local bikes!). Early start to climb Sigiriya. The climb to the top can be done even with young children (read a first-hand account here). Watch out for the monkeys (macaques)! We highly recommend the climb, but you don't have to do it – the gardens and the museum are worth a visit on their own. Afternoon at leisure to enjoy the pool on your last day. If you are feeling more active, our driver will be happy to take you to Minneriya National Park, a great place to see wild elephants. Just let him/our local office know beforehand and they can arrange an extra safari for you. If you'd prefer, you can forgo Sigiriya entirely and head over to the west coast on Day 13 to stay in a boutique hotel in Colombo (fairly long drive or train journey). You could visit Colombo Fort (or ask us if you'd like a tour in a vintage jeep) or perhaps do some shopping. Dine out in the restored Old Dutch Hospital in the fort – Ministry of Crab is very good. Time to say goodbye to Sri Lanka. You'll be driven to the airport for your flight back. This 15-day family adventure holiday costs from £1,925 per person, discounted to £1,847 for 12-15 year olds and £1,425 per child under 12 including international flights from the UK to Colombo, accommodation and meals as listed, activities/excursions and time with guides and local people, and a private chauffeur-driven vehicle throughout the tour. Please allow approximately ££50-80pp for government/site entrance fees, payable on the day at the site office. Discounts for under 12s. If you opt out of any excursions, you don't need to pay the entrance fee. Excluding flights, this tour costs £1,375 per person and £1,030 per child under 12. This trip can also be taken as a private tour for two including flights from £2,225 per person, or excluding flights from £1,675 per person. Small photos: Monkey by Jody Smith; Elephant by Marjorie Socha; Jeep in Yala and Little Adam's Peak by Ruth Brannvall; Anilana by Sanjaya Bandara.